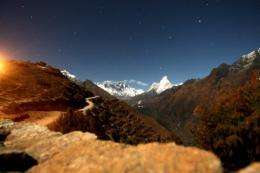 A long exposure of the Mount Everest range seen from Syangboche, a small Himalayan settlement some 140 km northeast of Kathmandu. Millions of people are under threat from melting of Himalayan glaciers, according to scientists carrying out the most comprehensive ever assessment of climate change in the region. Glaciers in the Himalayas have shrunk by as much as a fifth in just 30 years, scientists have claimed in the first authoritative confirmation of the effects of climate change on the region. The findings, published in three reports by the Kathmandu-based International Centre for Integrated Mountain Development (ICIMOD), show Nepal's glaciers have shrunk by 21 percent and Bhutan's by 22 percent over 30 years. The reports, launched on Sunday at the UN climate talks in Durban, South Africa, form the most comprehensive ever assessment of the extent of Himalayan ice melting. They follow a discredited announcement by scientists in 2007 that the region's glaciers would be gone by 2035. A three-year Sweden-funded research project led by ICIMOD showed 10 glaciers surveyed in the region all are shrinking, with a marked acceleration in loss of ice between 2002 and 2005. Another study found a significant reduction in snow cover across the region in the last decade. "These reports provide a new baseline and location-specific information for understanding climate change in one of the most vulnerable ecosystems in the world," Rajendra Pachauri, chairman of the Intergovernmental Panel on Climate Change (IPCC), said. "They substantially deepen our understanding of this region... while also pointing to the knowledge gaps yet to be filled and actions that must be taken to deal with the challenge of climate change." Scientists say the effects of climate change could be devastating, as the region provides food and energy for 1.3 billion people living in downstream river basins. Environmental campaigners refer to the Himalayas as the "third pole" and say the melting glaciers are the biggest potential contributors to rising sea levels after the north and south poles. "The Hindu Kush-Himalayan region is like a gentle giant. While physically imposing, it is one of the most ecologically sensitive areas in the world," said David Molden, director general of ICIMOD. Scientists say the glacial melting is creating huge lakes that threaten to burst and devastate mountain communities downstream. They warn that the glaciers could disappear within decades, bringing drought to swathes of Asia. "Up until now, there has been complete uncertainty on the numbers and area of glaciers and the present status of their environmental conditions in the region, said Basanta Shrestha from ICIMOD. The IPCC, a group of scientists convened by the United Nations to warn governments around the world about the effects of climate change, was forced to apologise in 2009 for claiming that the Himalayan glaciers would melt by 2035. If the rate of melting continued at the same as the linear average of the past 30 years, these glaciers would all be completely melted in 108 years, which would be 2119. Seeing as how better established trend lines of Arctic Sea Ice and Greenland ice caps net losses are now known to be exponential, it's highly likely that these mountain glaciers are also melting at an exponentially increasing rate. If the average rate of average net annual shrinking doubles only once every 30 years, then these glaciers would be gone in about 55 years.